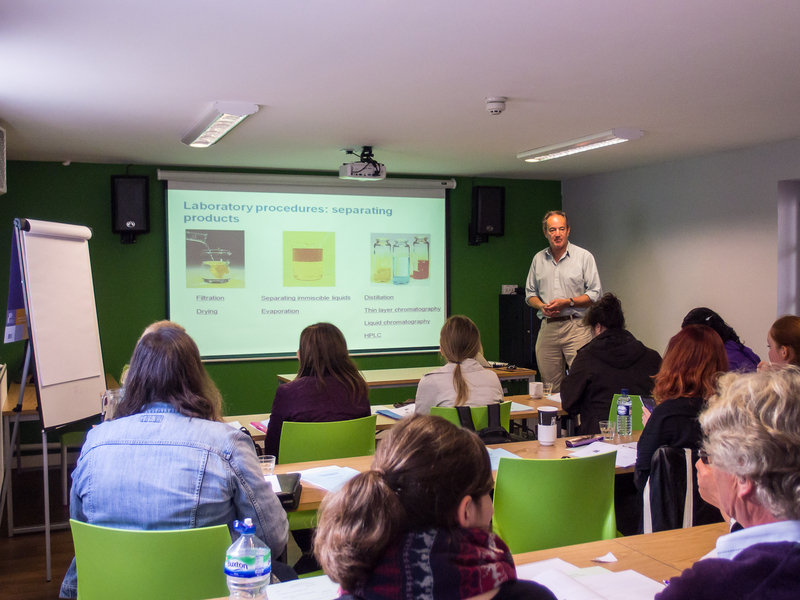 On Saturday October 3rd, Yorkshire Translators’ Network held it’s first-ever Chemistry for Translators workshop in York. Attended by about 40 translators covering a range of languages and specialisms and gathering from all parts of Yorkshire and beyond (including Ireland, Birmingham and the south), the one-day event gave a thorough overview of chemistry from the basics to the more advanced. Designed by PharmaGuide and presented by its founder, Dr. Ed Zanders, the course aimed to provide “a thorough grounding in the essentials of chemical science assuming little, or no, scientific training” and to enable participants to “gain more understanding of the terms that arise in technical translations and be more aware of the intricacies of the terminology used in this complex subject” (from the Course Guide). Having established the scope of chemistry in technical translation, such as medical and scientific subjects, five key areas were covered in the course: Foundations of chemistry; Chemistry in practice; Nomenclature and classification; Chemical reactions and synthesis; Document examples and chemistry translation issues. Each area was covered in some depth, and there was a significant variety in the topics chosen, ranging from a practical understanding of chemical methods and processes to a focus on chemical structures and their relevant notations. A range of relevant readings and resources were also provided for further study and use in translating documents. The course was well-paced and timed with opportunities for participants to ask questions and clarification of key points, and these were all answered during the day. There was a positive and friendly atmosphere throughout, and my impression was that all the translators present enhanced their learning and understanding of chemistry and were very satisfied with the event. Medical translator Brigitte Meile said “A fascinating workshop that made me see the world through the eyes of a chemist and enhanced my understanding of how to analyse and make sense of intricate chemical formulae. I particularly enjoyed Ed’s explanations of how miniscule variations in the molecular structure can have enormous effects on the properties of a substance, for instance in the case of limonene, which, as a right-facing stereoisomer, or an (R-)enantiomer, smells of oranges and as a (S-)enantiomer it has the flavour of lemons”. Personally, I also found the workshop highly stimulating, with superb content and presentation – even if it is just a first step in the process of translating chemical documents. Finally, after the event, more documentation was sent to participants via email, which included examples of a patent, a medicinal and a chemical safety report, as well as a list of abbreviations and further links. 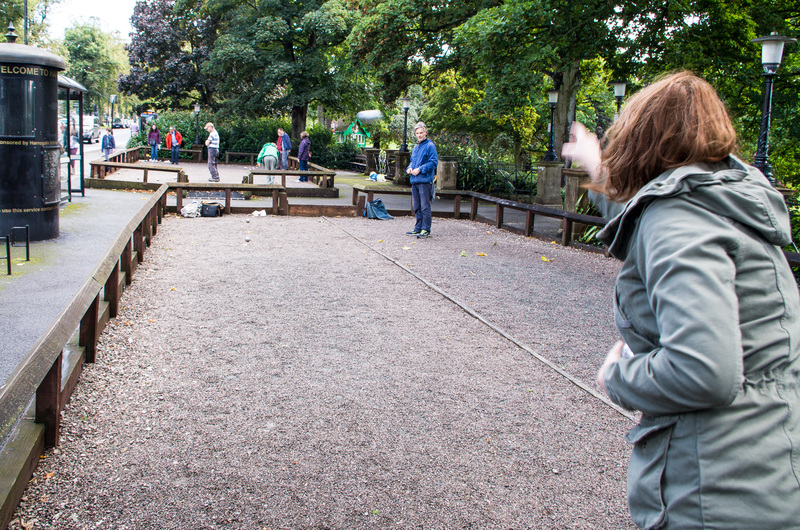 On the afternoon of Saturday, 12 September 2015, 13 of us braved the pelting rain and cool temperatures to meet at the Boulodrome at the Pier Head in the centre of Harrogate to learn all about the French game Boules, or Pétanque as some might call it. The Boulodrome is an installation with 2 terrains consisting of 2 pistes each that is open to the public and I was quite surprised to find such a thing right in the middle of a British town. I would have imagined it to be somewhere more hidden in a club that is for members only. The site was originally a Victorian viewing gallery forming part of the ornamental gardens laid out at the top of Montpellier Hill and the Pier Head actually forms the roof of public toilets which were decommissioned over 20 years ago, as the website of the Harrogate Montpellier Pétanque Club tells me. Two members of the Club outlined the rules to us and then we set off to learn it all by doing. We were divided in three groups of four people to try out our newly acquired knowledge and luckily the rain clouds made way for some lovely autumn sunshine. Within each group, we played against each other in pairs or threes. Nigel, one of the club members, joined my group, and it was great to learn first-hand from an already experienced person – although, to my shame, I then lost every game, even the one where I teamed up with Nigel. In the latter we were leading all the time by a huge margin and just needed one more point to win but in the end we were overtaken by our competitors who then took all the fame. Nevertheless, this surely did not spoil any of the fun I had and every one of us seemed to hugely enjoy themselves. 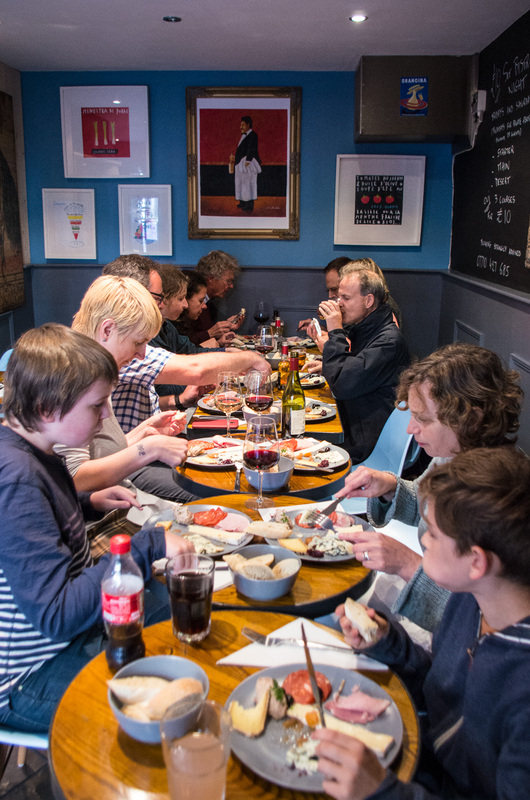 After two hours we retreated to the nearby French bistro Zinc where Olivier, the owner, had prepared for us the French equivalent of a Ploughman´s lunch with baguette, cold meats and cheeses which was rounded off with some yummy French cakes. The food was delicious and I think we all had worked up a good appetite after all this exercise in fresh air making the food taste even better. As always, this was also a good opportunity to chat with fellow translators and to get to know each other better. I always enjoy these occasions as during the discussions I have with others I always find that they have made the same or similar experiences in their life as translators than I and it is good to know that I am not alone. This is particularly valuable as translation on a freelance basis can be quite a lonely profession. All in all, it was a lovely and relaxed French-themed afternoon where even the weather gods meant well in the end.